Are you looking for a professional and reliable company to care for your window cleaning needs? Majestic Window Cleaning has been providing expert window cleaning services for homes and businesses in Suffolk and Nassau counties since 1998, and we are proud of the reputation we’ve built for quality workmanship, attention to detail and customer satisfaction. Call us today on 631-421-2295 to find out what we can do for you! We’re local and well known. We’re fully insured and bonded. We’ve over 15 years experience in the industry. We’re focused on quality results with every clean. We’re friendly and easy to deal with. Window washing can transform the feel of your home making it brighter and lighter almost instantly, improving the views in every direction. Let Majestic take care of your window cleaning chore while you use the time for more important things! For businesses, sparkling clean windows help your premises give the right first impression, that can be so vital to attracting customers and making sales. We offer regular window washing services, tailored to your specific needs, that will ensure your windows are sparkling all year round! We offer professional window cleaning for homes, commercial buildings, car dealerships, retail storefronts, restaurants, interior showcases, banks and more all across Long Island. Mike and his team were all gentleman from the start. What a pleasure to deal with. They arrived on time and began to wash our homes windows and screens. No mess no hassle. His team also protected my bushes when they began to power wash all of the summers dirt of my house. It came out so well that I asked for them to clean my 24′ travel camper. I would definitely use Majestic in the future and highly recommend them. I’ve been using Majestic for two years now twice a year. Mike the owner is a great guy and personally does the work with another guy. He takes pride in his work and it shows. 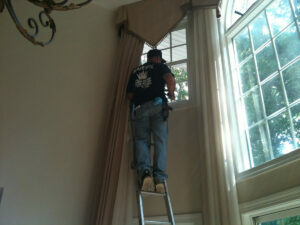 My Windows always come out beautiful and they take great care when removing the grills and screens. The prices are more than fair and as with anything you get what you pay for. Looking forward to them power washing my entire house this fall. Keep up the good work.